Even those with mere peripheral interest in classical music cannot resist the charm of Johannes Brahms’ Second Symphony which was played by The Orchestra Now under the baton of conductor Fabio Luisi, the new Director of the Dallas Symphony Orchestra, at Lincoln Center’s Rose Theater this past Tuesday night. Pairing this renowned gem with an important, yet less famous work, Edvard Grieg’s Piano Concerto in A minor, Op 16, with featured pianist Alessandro Taverna from Italy, provided a welcome repast. Hard to imagine a more felicitous program to welcome Spring! […] Greig’s youthful piano concerto has no program associated with it, yet I could not help thinking that the four movements charted a single day: thunder-roll sunrise, a pleasant afternoon with a sudden downpour, the tenderness of a colorful sinking sunset with which Alessandro Taverna, playing from memory, was so sensitively eloquent, and nighttime dancehall folk gathering that featured in 2/4 time a crescendo shower before the climatic thunderstorm drenching that concludes the concerto with satisfactory wonder. Alessandro was cleanly bright on the Italian Fazoli piano with the lighter luster of its Romantic timbre. Leah Stevens was impressive in a short solo. Luisi was impishly meticulous in his ardent direction. Expectations are particularly high for an audience assembled to experience Grieg’s acclaimed Piano Concerto in A minor, Op. 16 (1868). Dedicated to pianist Edmund Neupart, it portrays Grieg’s love of nature, expressing through soaring romanticism affection for his native Norway and its music. Having written the concerto at age 24 while on a summer countryside vacation, it is described by Grieg’s biographer Richard H. Stein as “all Norway in its infinite variety and unity”. Stein compared the adagio to a “lonely mountain-girt tarn which lies dreaming of infinity.” The premiere was attended by international music luminaries like Neils Gade and Anton Rubinstein. The Orchestra Now (TŌN) percussionist Miles Salerni provided a personal, charming and informative introduction to the Grieg work. Franz Liszt once performed the work prima vista, acclaiming its genius and beauty while providing Grieg with suggested modifications. Grieg edited this work throughout his life with the final version completed just weeks before his death. That version is performed tonight. Salerni noted the concerto’s fame is matched by Grieg’s Peer Gynt Suite, Op. 23, incidental music to Henrik Ibsen’s 1867 play of the same name. He cued a bassoonist to perform the familiar Hall of the Mountain King theme. This means of familiarizing audiences with music and musicians elicits memories of Leonard Bernstein’s delightful practice of speaking from the conductor’s podium. Salerni’s insightful comments were well received. 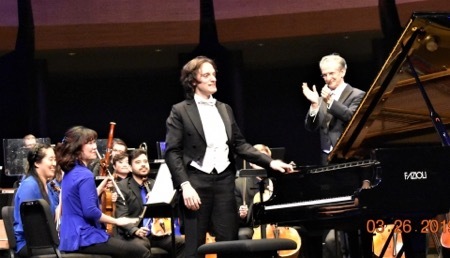 Conductor Fabio Luisi followed pianist Alessandro Taverna to the stage and the concert began with a captivating, momentous descending piano flourish and ascending arpeggios utilizing the full range of the concert grand piano. Luisi’s conducting was precise, expressive, and effective in leading the orchestra. Taverna’s performance was masterful and particularly vital in the exciting closing Quasi presto – Andante maestoso segments. […] Oh, the pianist. Alessandro Taverna, an international prize-winning concert soloist, projected the Grieg’s bigger passages with a resounding, full-bodied resonance, and his scales and flourishes were dazzlingly articulate. Neither did he scant the dancier or more intimate moments: I particularly liked his waltzy inflection of the finale’s Quasi presto. Only in the “whirling” passage of the first-movement cadenza would I have liked the theme to be set in sharper relief: piano, granted, but it wasn’t strong enough to cut through the tremolando accompaniments.